Download "MIS 460 Project Management"
1 Ursuline College Accelerated Program CRITICAL INFORMATION! 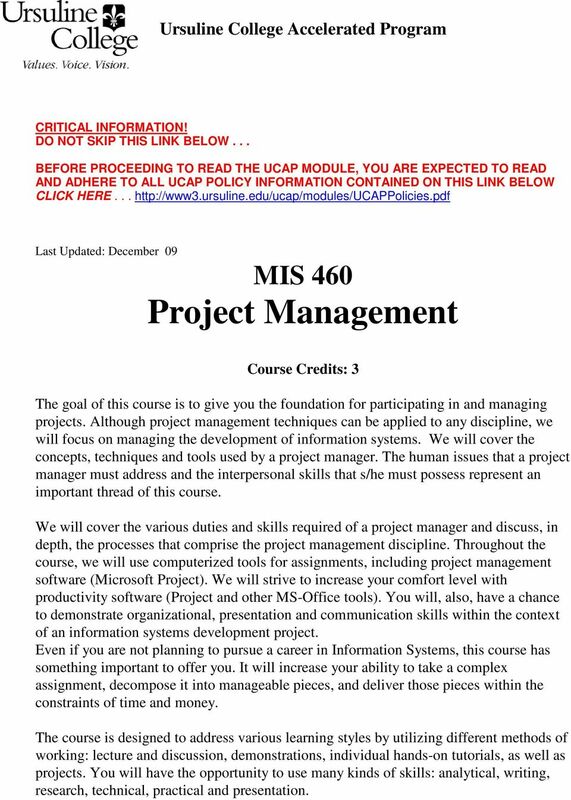 DO NOT SKIP THIS LINK BELOW... BEFORE PROCEEDING TO READ THE UCAP MODULE, YOU ARE EXPECTED TO READ AND ADHERE TO ALL UCAP POLICY INFORMATION CONTAINED ON THIS LINK BELOW CLICK HERE... Last Updated: December 09 MIS 460 Project Management Course Credits: 3 The goal of this course is to give you the foundation for participating in and managing projects. Although project management techniques can be applied to any discipline, we will focus on managing the development of information systems. We will cover the concepts, techniques and tools used by a project manager. The human issues that a project manager must address and the interpersonal skills that s/he must possess represent an important thread of this course. We will cover the various duties and skills required of a project manager and discuss, in depth, the processes that comprise the project management discipline. 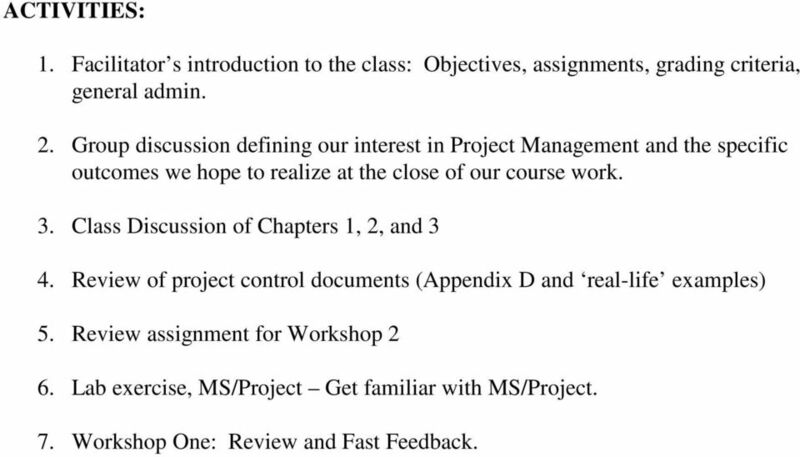 Throughout the course, we will use computerized tools for assignments, including project management software (Microsoft Project). We will strive to increase your comfort level with productivity software (Project and other MS-Office tools). You will, also, have a chance to demonstrate organizational, presentation and communication skills within the context of an information systems development project. Even if you are not planning to pursue a career in Information Systems, this course has something important to offer you. It will increase your ability to take a complex assignment, decompose it into manageable pieces, and deliver those pieces within the constraints of time and money. The course is designed to address various learning styles by utilizing different methods of working: lecture and discussion, demonstrations, individual hands-on tutorials, as well as projects. You will have the opportunity to use many kinds of skills: analytical, writing, research, technical, practical and presentation. 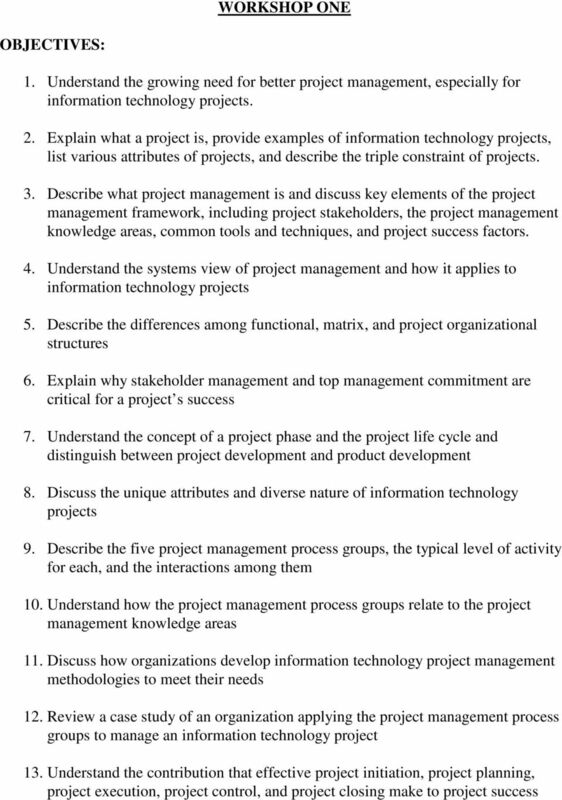 2 Textbooks/Materials: Information Technology Project Management, Kathy Schwalbe, 6th Edition. (Required) ISBN (13): ISBN (10): Microsoft Project software (Installed in the MIS lab a trial version is included in the text). USB Memory Device. Note concerning the text: The text includes a CD with MS-Project and other resources on it. It also includes an access code for the companion web-site. Should students buy the text used (or international version, etc), these items may not be included and the student will be responsible for obtaining them. Instructional Outcomes (upon successful completion of this course) Knowledge Understand the processes that comprise project management: initiating, planning, executing, controlling, and closing. Understand the knowledge areas that comprise project management: project integration management, project scope management, project time management, project cost management, project quality management, project human resource management, project communication management, project risk management, and project procurement management. Recognize the interrelationship between systems analysis and project management. Develop a solid grounding in the application of project management techniques through an actual information systems development effort. Learn the terminology and concepts associated with the field of project management. Become familiar with online and print resources for project managers. Skills Initiate, plan, execute, control, and close an information systems development project within time and budget constraints. Use various software tools to project management the development effort (i.e. develop a project schedule). Develop and deliver project status reports to your customer. Learn how to handle human resource issues, both from a customer and a project team perspective. Learn project management terminology. Learn the characteristics that make for a successful project. Improve written and oral communication skills, supported by the use of a computer. Attitudes Respect the customer, their needs and the business point of view. 3 Establish an ethic of efficiency as well as thoroughness. Strive to create value for the organization. Values Place a premium on quality throughout the systems development process. 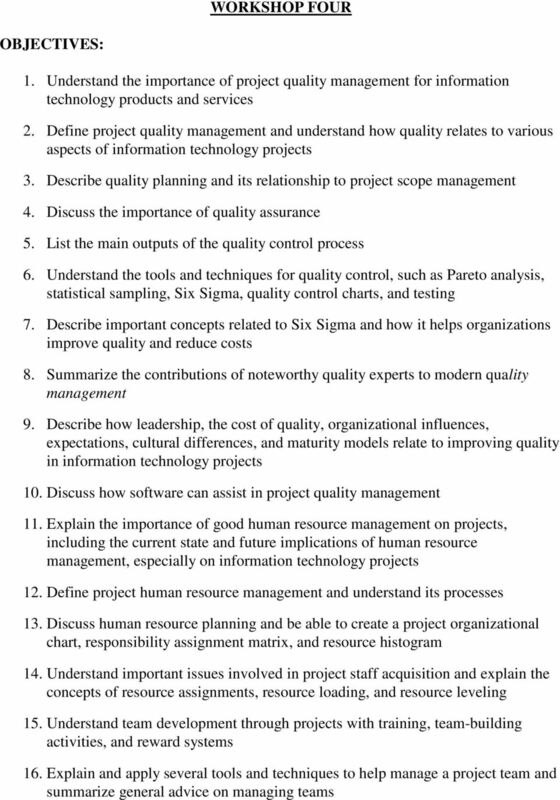 Value the ethics of the project management profession as defined by professional societies. Requirements: Multiple written assignments and a semester project relating to various topics covered in the course. There will be weekly quizzes and a final, which will cover the textbook readings, lectures and class work. A final in-class presentation will also be required (unless previous arrangements have been made). If you elect to drop this course, you must complete the appropriate forms in the Office of Student Services. Students still enrolled at the end of the semester will receive a final grade based on their point accumulation during the semester. 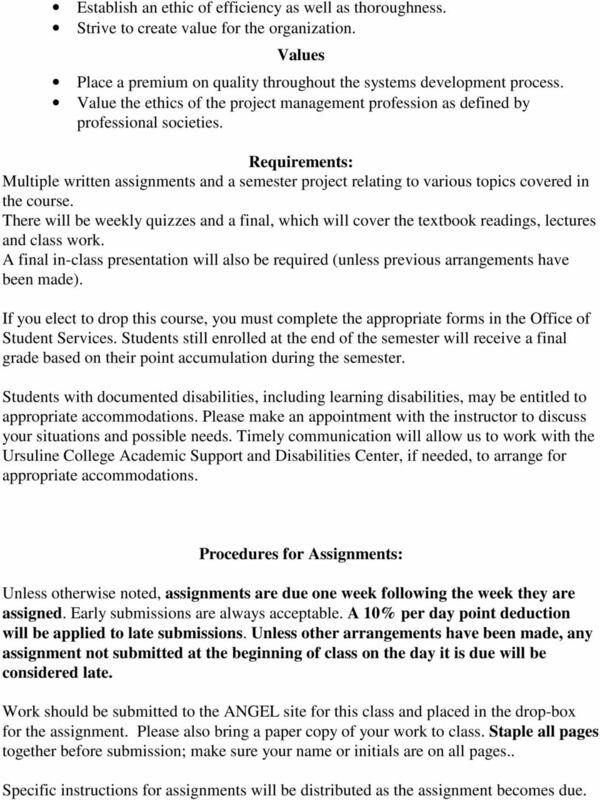 Students with documented disabilities, including learning disabilities, may be entitled to appropriate accommodations. Please make an appointment with the instructor to discuss your situations and possible needs. Timely communication will allow us to work with the Ursuline College Academic Support and Disabilities Center, if needed, to arrange for appropriate accommodations. Procedures for Assignments: Unless otherwise noted, assignments are due one week following the week they are assigned. Early submissions are always acceptable. A 10% per day point deduction will be applied to late submissions. Unless other arrangements have been made, any assignment not submitted at the beginning of class on the day it is due will be considered late. Work should be submitted to the ANGEL site for this class and placed in the drop-box for the assignment. Please also bring a paper copy of your work to class. Staple all pages together before submission; make sure your name or initials are on all pages.. 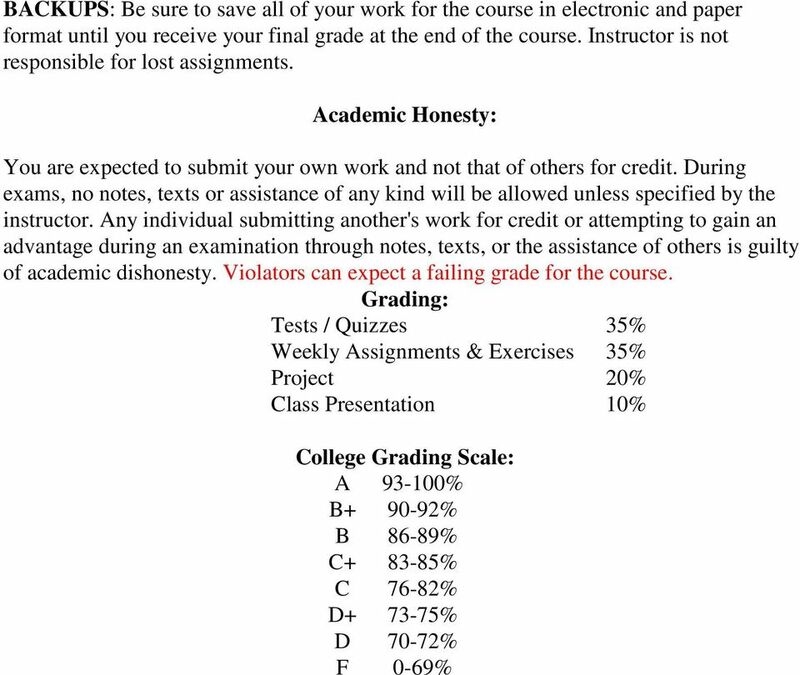 Specific instructions for assignments will be distributed as the assignment becomes due. 7 ACTIVITIES: 1. Facilitator s introduction to the class: Objectives, assignments, grading criteria, general admin. 2. Group discussion defining our interest in Project Management and the specific outcomes we hope to realize at the close of our course work. 3. 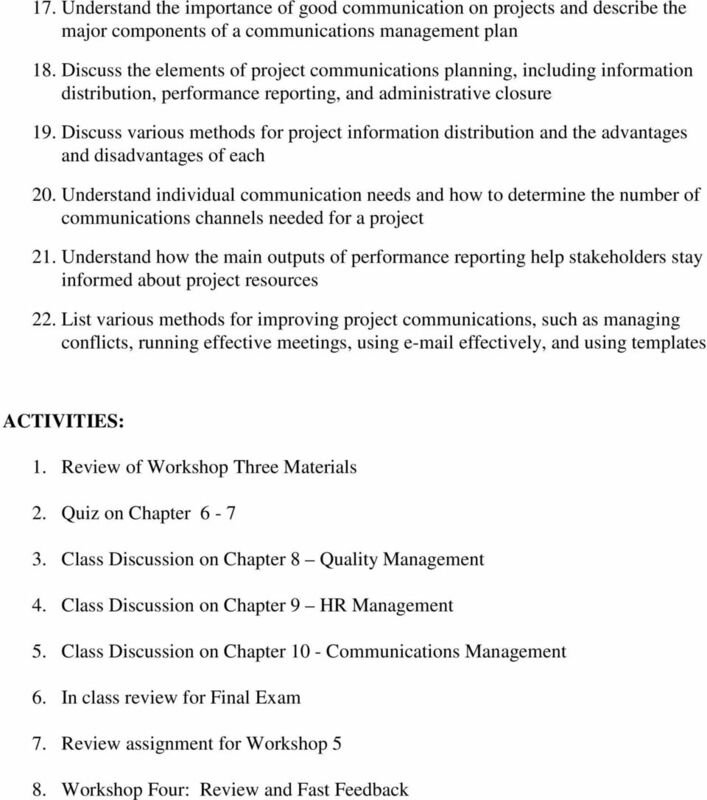 Class Discussion of Chapters 1, 2, and 3 4. Review of project control documents (Appendix D and real-life examples) 5. Review assignment for Workshop 2 6. Lab exercise, MS/Project Get familiar with MS/Project. 7. Workshop One: Review and Fast Feedback. 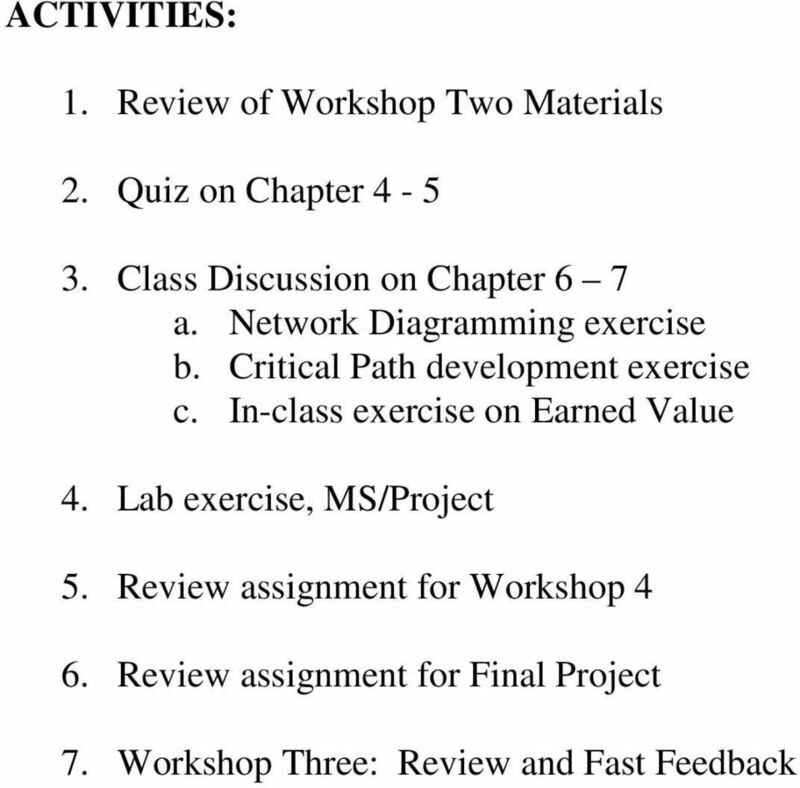 8 ASSIGNMENTS TO BE COMPLETED PRIOR TO WORKSHOP TWO: Information Technology Project Management: 1. Read Chapters 4-5 and be prepared to answer the Discussion Questions 2. 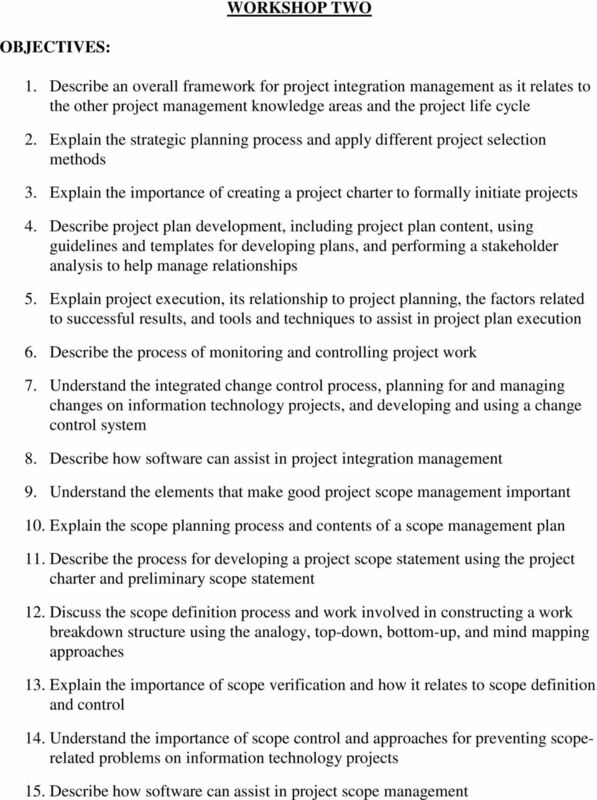 Chapter 1 Exercise 2: Project Manager Interview 3. Pick out a running case: either the Green Computing Research Project, the Project Management Videos project (from Appendix C) the Remote Capture project, or the Short Film (from ANGEL). 4. Chapter 3 Exercise 1: Gantt chart. Bring a printed copy to turn in at the beginning of class and post to the drop-box in ANGEL. 5. 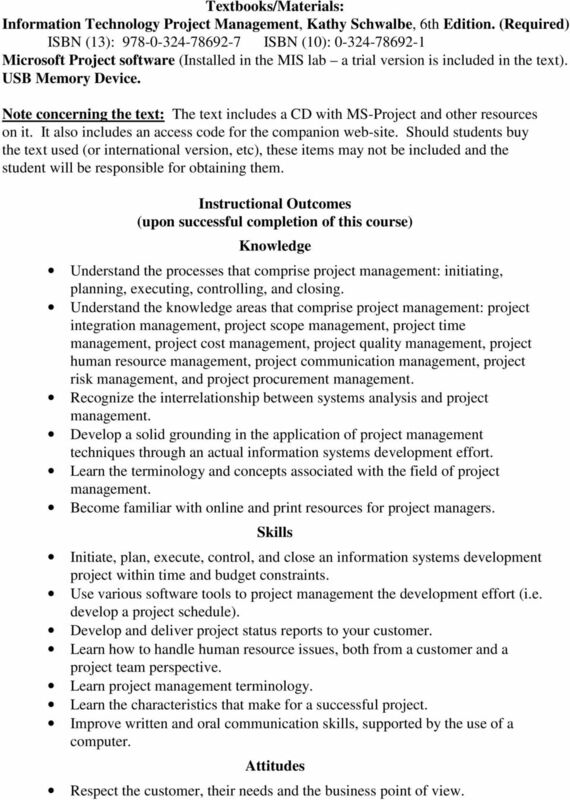 Complete assignment on Project initiation documents: Business Case, Charter, Contract, and Scope Statement. Bring a printed copy to turn in at the beginning of class and post to the dropbox in ANGEL. 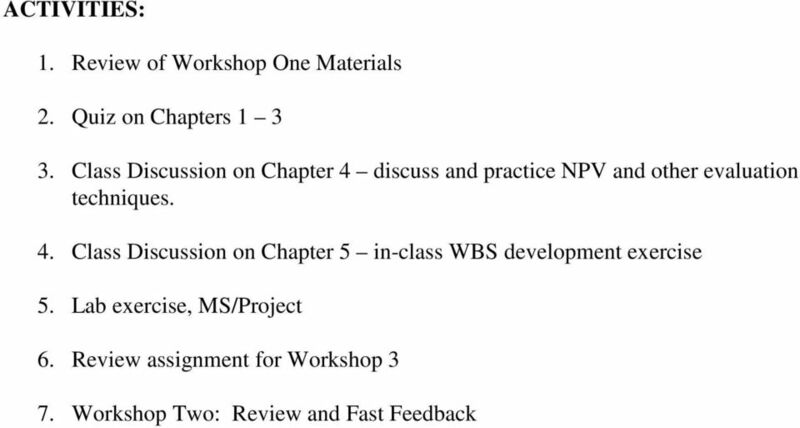 11 ASSIGNMENTS TO BE COMPLETED PRIOR TO WORKSHOP THREE: Information Technology Project Management: 1. Read Chapters 6-7 and be prepared to answer the Discussion Questions 2. 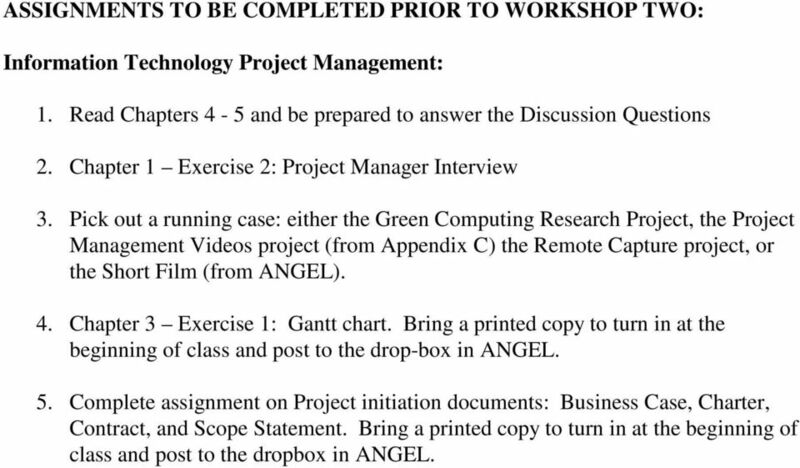 Complete assignment on Work-Break Structure and developing an initial Gantt chart, per facilitator instructions. 3. 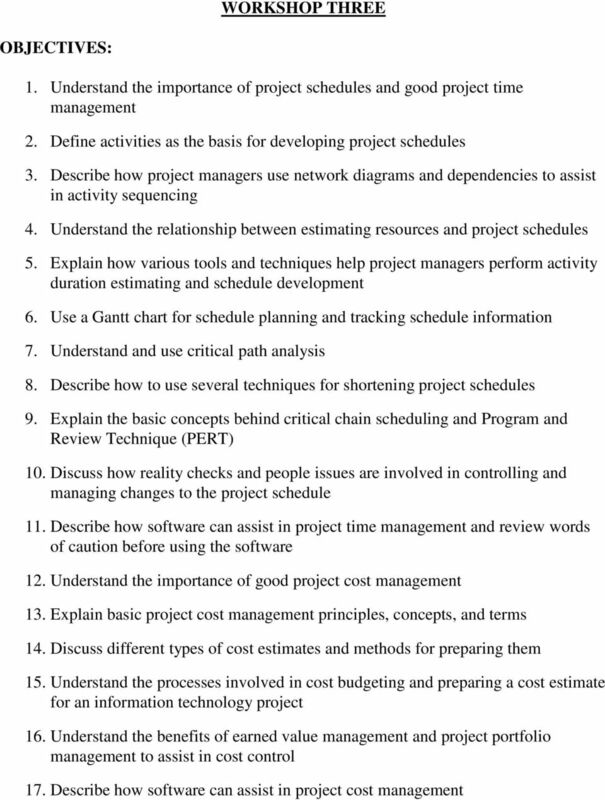 Complete assignment on Resource Loading the Project Schedule and Cash Flow Forecasting per facilitator instructions.